Step back into time for your vintage vacation. 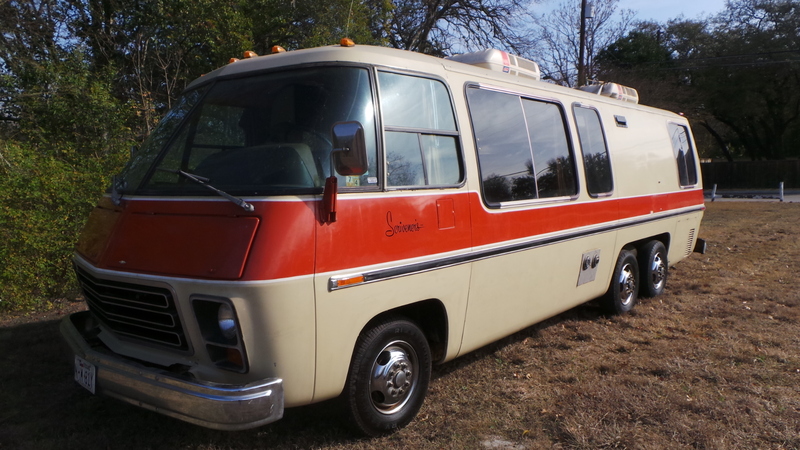 I recently uncovered this 1973 GMC futuristic Motorhome. I can send you pictures as I found it. The entire RV had been stored sitting up on huge jack stands in a warehouse for 22 years! Within five hours of work we had it running, off the stands and drove it home. Amazing!!! The motorhome was owned originally by Mr. and Mrs. Scrivener of the very well known San Antonio department Store “Scrivener’s that was located at Broadway and 410. The RV has survived in amazing original condition since it was stored indoors. It has only 60k original miles and is powered by its original 455 Olds Big Block and front wheel drive transaxle. The unit has air ride suspension and the air bags were replaced new a few years ago while stored. The RV lifted up and floated down the road. The RV has dual rotary Air Conditioning units, Kitchen, and bathroom with shower. It sleeps up to six people. The couch fold up and makes a super cool bunk bed that hangs from the ceiling. The dinette set drops down for a twin and the rear RV dual couches transform into a cozy double bed. The Motorhome has a clean 6000 watt Onan Generator onboard too. Currently untested. Please call for more details. The unit is located in San Antonio. Call Hawkeye for a showing.